A series of articles on gardening in general from Jean Marshall, Author, Cake-Maker and gardener for over 60 years. For those who are contemplating a move and are worried about which of your much loved plants and how many, you can successfully take with you, here are a few thoughts. From a legal point of view, provided you have the departing plants ready to clearly show your future buyers and the Estate Agent, there is no problem. From a logistical point of view there may be more to it! We embarked on a move of 650 miles from the south coast to the Highlands. We had in the car with us 2 dogs (large), 3 free range cats (miserable and vocal), blankets, and a dirt box, (which needed emptying within half an hour of leaving the Beach). We also had cat, dog and incidentally human food. Following us was an enormous pantechnicon with all our wordly belongings, including over 100 plants of varying sizes in pots, tubs, sinks, dustbins, buckets and anything else we could press into service. 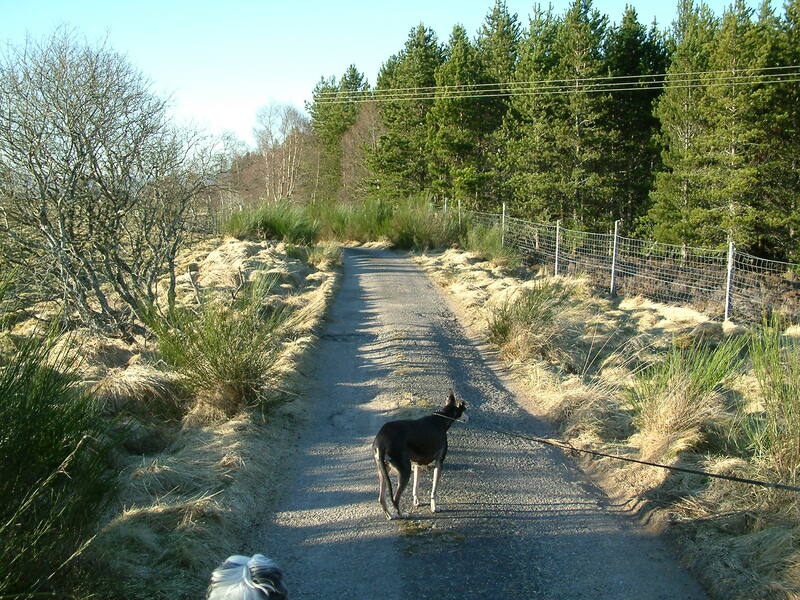 Our Croft cottage is about ¾ mile along a very rough track. 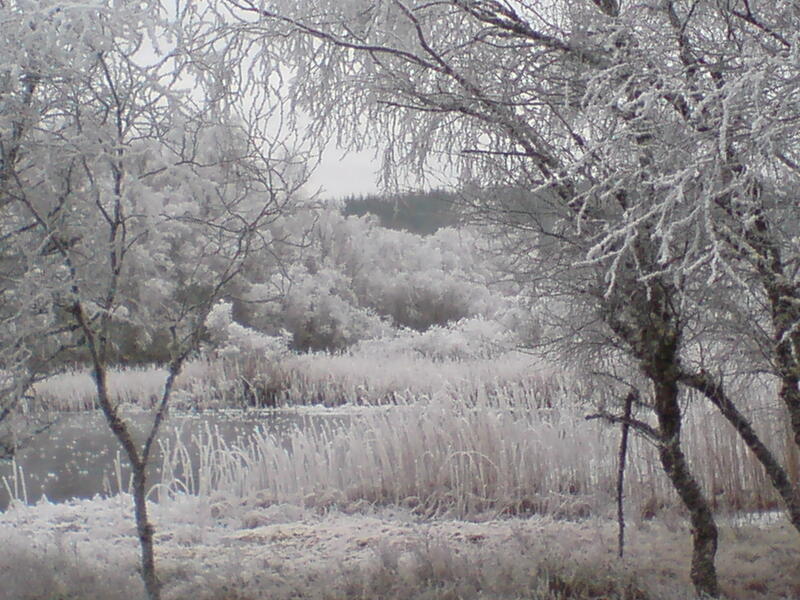 It was (of course) snowing hard at the time of arrival. The Pickfords driver, who had been told to wait at the entrance to the track whilst his Foreman came up to assess the situation, in his infinite wisdom/crass ignorance/desire to show what stuff he was made of, ignored this request and set off up the track ignoring the heavy snow. Consequently, during the discussing between, my husband David, and the removal Overseer as to what should be done in this vile weather, the bombshell arrived in the person of a very nice neighbour who lives half a mile down the track saying ‘Jean your removal van has gone down the drain on the corner and is at a quite alarming angle’. It took three attempts by our local contractor, and larger equipment each time, to haul the van out. To this day that corner is referred to as “Pickfords Corner” by the locals. At least all the plants were off-loaded into our Bothy safely, including my very large Rhododendron Decorum. I think I should say that if any of you be foolish enough to attempt to emulate this little jaunt with many plants it is really better not to go for the ‘cut price’ removal companies. 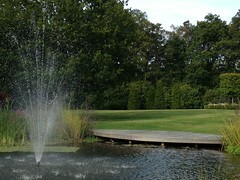 We have found that the really experienced firms are worth every penny and do know how to handle the plants. 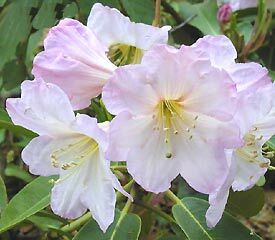 Sadly ten years on from the aforementioned move, my 20 year old Rhododendron Decorum, has succumbed to the vagaries of the Scottish climate (should have left it at Winchelsea Beach) It is one of the rather rarer scented varieties. I think this may be unwise to replace but I do have King George Loderii which is also scented and is a much tougher plant. 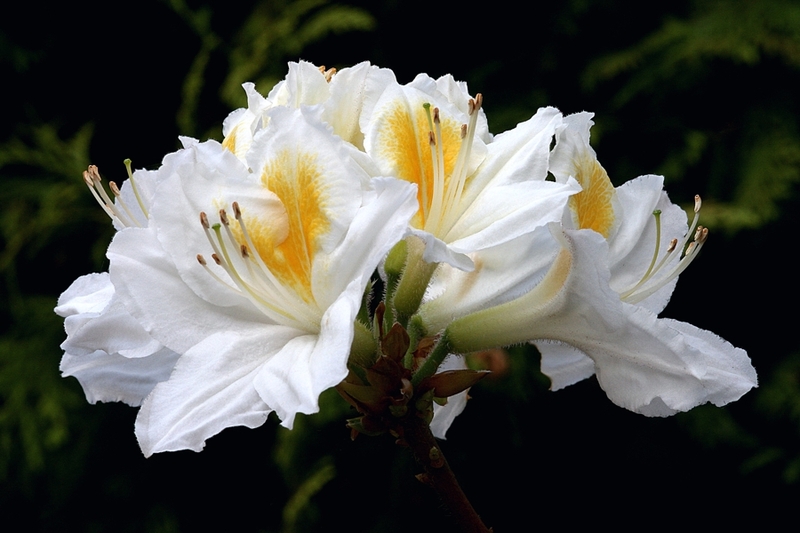 The scented varieties of both Rhododendron and Azalea are well worth tracking down- Azalea ‘Persil’ and ‘Oxydol’ are both wonderfully scented white varieties (if appalingly named!). 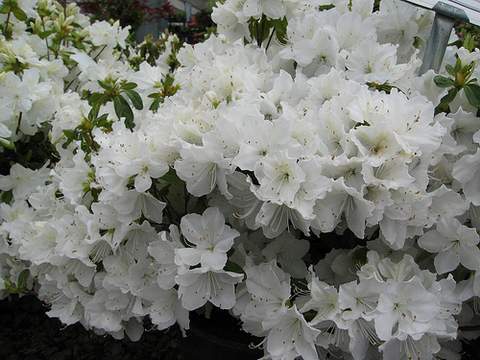 A key point I found out the other day, having been a bit concerned that my Azaleas were very reluctant to flower, was that they should not be planted too deeply, which I have! Also that mulch should be applied to them covering the area of the plants spread above ground. 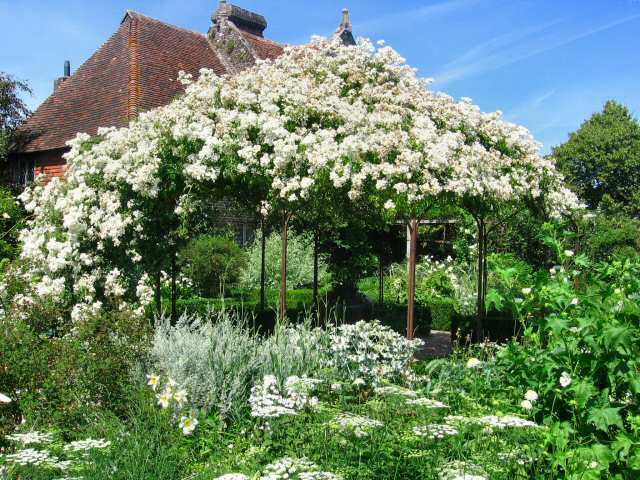 I expect many readers have visited at some time over the years, the gardens at Sissinghurst planted by Vita Sackville West. I see it has acquired a new and very experienced Head Gardener. Troy Scott Smith transferred from Bodnant, and looks as though he will be well suited to continuing and expanding this lovely unmissable garden. 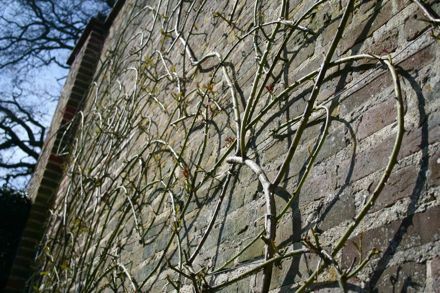 I have used the Sissinghurst method of pruning climbers and ramblers with modest success. For anyone who doesn’t know, here it is. For climbers and ramblers start in November and cut off most of that year’s growth thus keeping the framework of the rose clear and preventing the plant from becoming too woody. Next, large woody stems are taken out almost to the base to encourage new shoots which will flower the following year. The remaining branches are re attached to the wall stem by stem, starting from the middle of the plant, working outwards, with the pruned tip of each branch bent down and attached to the one below. Some climbers can be a bit more reluctant to the bending like Albertine whereas some like Rosa Mulliganii are very bendy and easy to train. There is a technique for Shrub roses also, which I will pass on in the next instalment. Has anyone heard of what I think is called the ‘Irish Chop’ for propagating peonies? You take an outside piece of the existing plant which has a shoot coming up at the base, and firmly tear it away from the main plant. I got out into my Rose Garden last week and found the piece I wished to detach from the main plant, I grasped firmly and……my nerve failed…….I came indoor for a coffee and a dram to recover my strength of purpose, which I may say has not come back yet in this matter. I have finally with much relief finished pruning, feeding and mulching my roses and the big shrubs, some of which had looked a bit sad after the winter. Now going to attack my Viburnums (you have probably done yours). Just remember that Viburnum (could the plural be Viburna?) can be temperamental and need careful pruning – definitely not the “slash and burn” family. 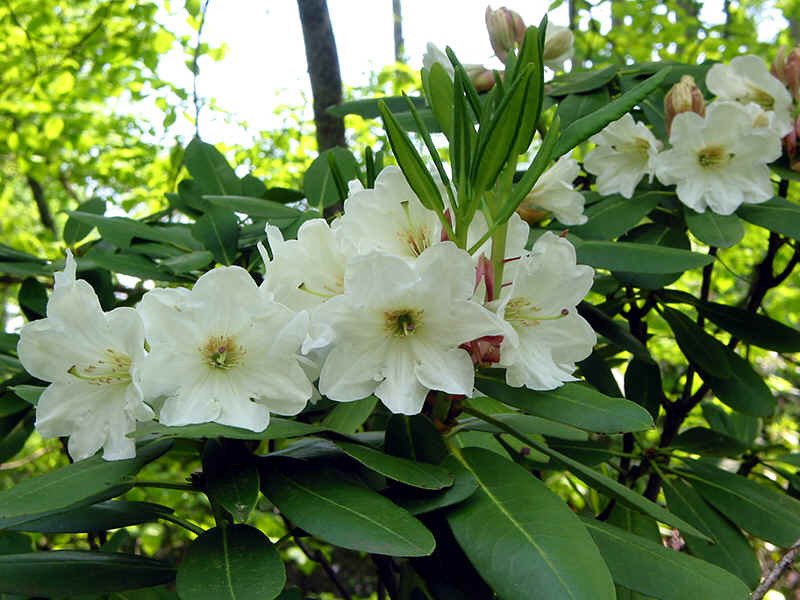 Perhaps if the shrub is quite large a few of the older branches could be removed after flowering. Incidentally I underplanted my Viburnum bodnantense ‘Dawn’ with Euonymus fortuneii ‘Emerald Gaiety’ and am pleased with the result. An alternative might have been ‘Emerald and Gold’. Have you noticed one of the good things about gardening is that if you force yourself out despite it looking cold and uninviting, even for short periods of raking leaves and picking up twigs and stuff, that small amount of work does show, and you feel so good viewing the difference…… also, have you noticed how, whatever job you do, you are left with half a dozen new ones! If you are looking for a medium sized tree with a smell which permeates the whole garden, the Balsam Poplar is great. I have five which at this time of year (May) come into leaf with a heady and sweet smell. They are very good tempered and I keep mine pruned to the size I want. As I do not appear to have been given the boot, I thought I might continue a bit longer with ‘Lets Talk about…’. Sometimes a slight misnomer as I do wander off the point at times! Thank you everyone for your kind comments which I had not expected, but will endeavour to keep your interest for a while longer… I could write a book about gardening on a half-acre shingle beach facing the sea, but that’s another story! As I mentioned in my previous article, the question of moles, can be a problem for a lot of us. I suppose everyone has their pet dislikes and/or problems, one of my very minor ones was that whilst I was always very anxious to show my husband my latest plant in situ on his return home from work, he insisted that this could not be done without a gin and tonic in his hand, and definitely not in the rain. What a wimp! My serious problem certainly is the moles. I have quite a large garden, in parts resembling a neglected field, but some of it quite respectable. Moles I have in abundance. 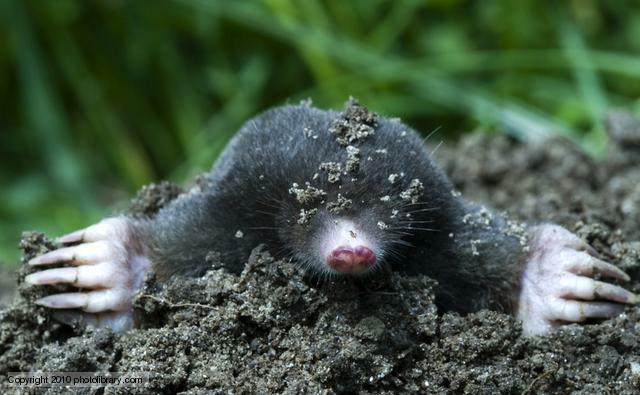 A friend who helps me with the garden and is a somewhat dour Scot said “Jean, it may only be one or two very active moles”. I looked at him and then at the mole hills and undermined grass and said “this is not the work of one or two moles on Ecstasy, this is a whole army of greedy little varmints!” I have tried stamping down the mounds as they start up – I have put to good use the soil earthed up and felt that at least I was doing something constructive. I have sonic devices everywhere; I have shown my Bearded Collie the moving earth. She, after carefully reviewing the situation, pointed out to me that Beardies are Herders not Hunters. I have watched my cat sit intensely watching the earth move for minutes on end and then flick her tail and go off after more interesting pastimes. I have thought long and hard about this problem, as a Buddhist I simply cannot take away the lives of these little creatures, so I am now acquiring a garden full of potted plants, – call it cowardice and not what I had in mind originally , but I do feel I can live with this solution. I suppose I could suggest to the dog that if she is a ‘herder’ as she claims, then she could try herding them down into the 11 hectares of field below me! 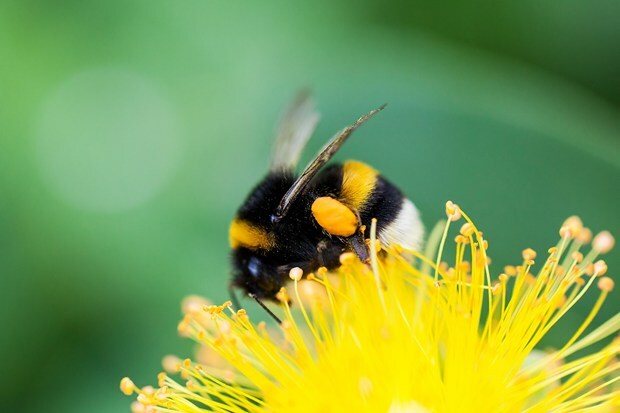 On another matter, the ongoing worry of what products are, or might be, harmful to our bee population continues, and hopefully the ‘experts’ will come up with further information on this subject shortly, meanwhile I think the advice given by the Royal Horticultural Society is sensible. They urge gardeners “to use all systemic insecticides with caution, follow instructions to the letter and spray at dusk, never when plants are in flower, and only when they are damaged by insect attack.” I think our old practice of using them as a preventative is quite definitely frowned upon. Hedgehogs are apparently seriously declining probably due to the reduction of their habitat, concreting of drives and large parts of garden. It is suggested that they need a 5” gap to gain entrance to your garden and again that patch left wild which suits bees and butterflies at a high level, helps the hedgehogs to have somewhere to rootle around amongst the ground debris. We are asked to move material in a pile before burning it and to be careful about ramming a fork into compost heaps. Any queries to British Hedgehog Protection Society 01584 890801 or britishhedgehogs.org.uk. “Gardening, like love, is a funny thing…………and doesn’t always yield to analysis”. I suspect that most of us who garden, at this time of the year, depending on health and weather, are getting either fired up enthusiastically surrounded by gardening magazines or sinking quietly into depression at the thought of the work to come. I don’t intend this column to be an extract from any one of many gardening mags, but more a written chat on the many aspects of gardening . 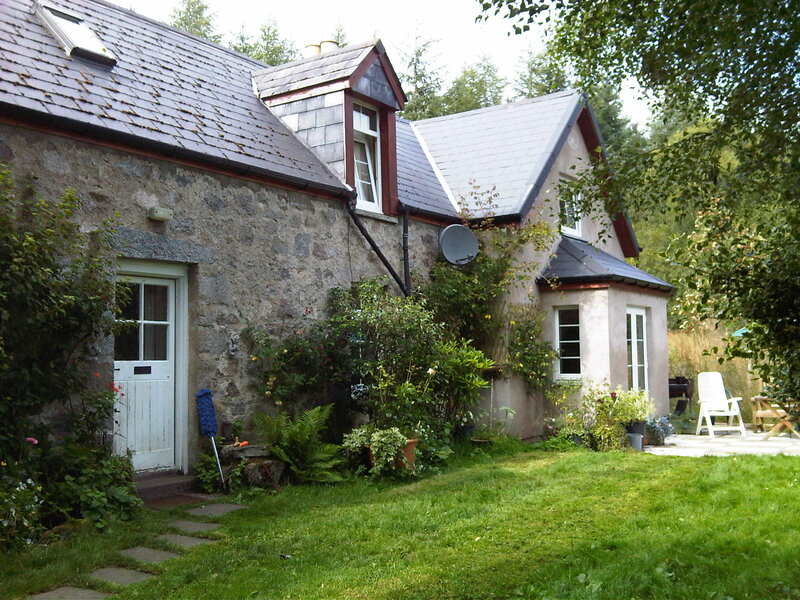 On a brief personal note, I have been gardening (sort of) for around 50 years in Kent and Sussex and for the last 10 years 800 foot up a hillside in the Highlands of Scotland, which has been quite a challenge – a little more on that subject at a later date. 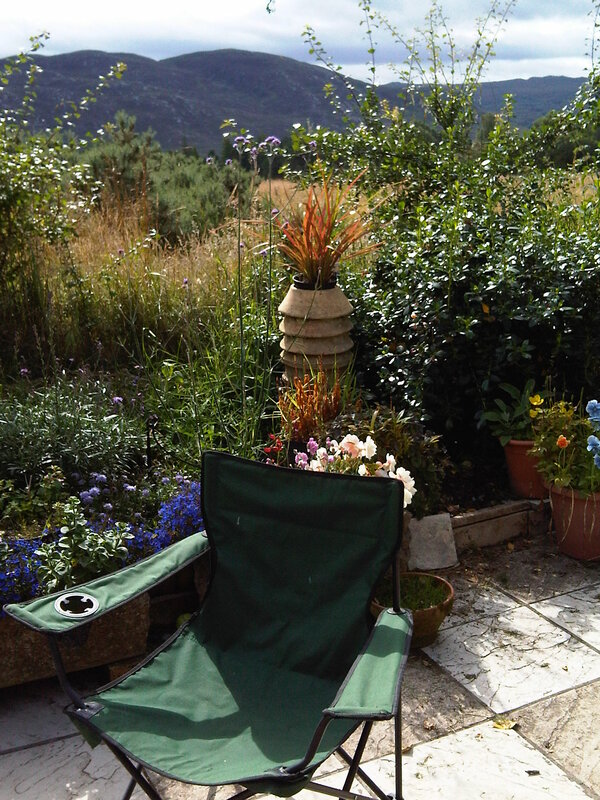 The view from the french doors of the Croft to the hills beyond-pictured on a summer day-seems a long way off right now! In this day and age we are swamped with newspapers and magazines telling us that we are not bona fide members of the gardening fraternity unless we own all the latest tools , and have a patch loaded with expensive and not always suitable shrubs and flowers. One of the loveliest and most sweetly scented gardens I have seen was owned by a 90 year old, who was not very mobile and weeded with a large kitchen fork. Most of her plants were snowdrops and self sown tiny plants-but her small plot was beautiful. There are many and varied garden implements but for someone starting I would think a few vital tools of the best quality one can afford. Spade, Fork (lightweight if lifting is a problem for you) , trowel and hand fork, kneeling pad or old cushion (from experience very necessary), rake, hoe and garden broom – that’s a good start, and one can gradually enlarge on this little collection. 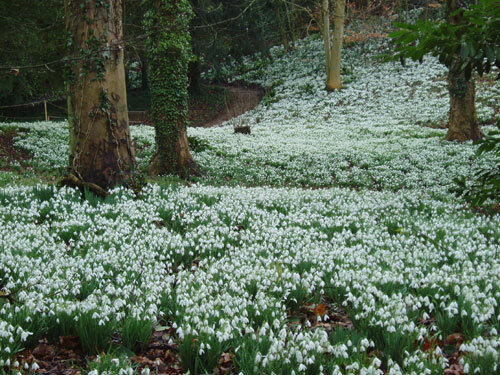 It’s a lovely time of the year for snowdrops, anemones, crocus etc. I always need to rake up for compost the many leaves which cover the ground and it’s so pleasing to see the spring bulbs peeping up from the ground (still frozen). For me, not so pleasing are the underground tunnels made by my family of moles. More about them another time! I suppose one of the things which keep a lot of us ”at the grindstone” is the constant surprises that we get. Plants that are quite delicate will sometimes survive a bitter winter whilst tough old shrubs will suddenly kick up their toes and collapse. I have an 8 year old Ceanothus which no way should survive in a Highland garden, but has flowered throughout this last winter, with temperatures as low as minus 18ºC. Yet a hardy climbing rose New Dawn which has decorated the Croft wall for 20 odd years is very dead. A constant joy I find is that one’s garden does often become a sort of “memory lane”. Plants given by good friends, who you think of as you walk round, and with a small pang those we pass who are in memory of loved ones. I had a super neighbour, now long gone, who whenever I was having a bad patch would leave a small bunch of winter flowering iris wrapped in kitchen towel on my front door step. Nothing had to be said, I knew what her message for me was, and I cannot pass the bulbs I planted in her memory without recalling her with love. I am sure there are many different sorts of gardeners, all of us producing, or hoping to, a garden which gives us pleasure and satisfaction. I have looked at beautiful, orderly, tidy plots with envy and admiration, but often it’s just a wafting perfume or colour combination which pulls at your heart strings. I don’t think it matters what impression our gardens give, as long as they give pleasure to the owners, and perhaps lifts their hearts. I started off this article by asking myself “why do we garden?”, what makes so many of us, previously of moderately sound mind, plough out often on cold, wet miserable days, to mend a wind break, tie in a support which has fallen and is in fact crucifying a plant, only to find on returning to the shelter of the house, that it has all come apart anyway! So, again, why do we do it? Is it because as children we used to help Dad or Granddad and we have warm memories of these days. 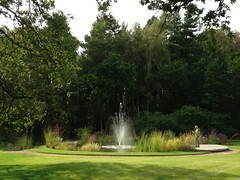 Is it for relaxation, one would not necessarily consider some garden jobs as particularly restful. Is it the satisfaction of achieving as previously mentioned a picture which gives us personal pleasure? It seems to be the sum total of quite a few different things. A modicum of self-satisfaction , a bit of healthy exercise, a strong response to the senses – sight, smell, touch and finally something not quite definable , to do with who we are, where we came from and some protection from the stresses of the outside world. Next month I think I must get down to the nitty-gritty of planting, but there is so much more to the pleasure of gardening than just planting flowers. Most excellent first blog – let’s look forward to many more ! Say hi to Ruth for me. What a pleasure that was to read! Looking forward to the next one. Thank you Jean for reminding us why we garden. You have eased the pain after removing an old Ceonothus, and give me an excitement in choosing what to put in the space! Jean, thank you for your comment- yes we too feel inspired when we hear the tales of gardeners dealing with the real world of gardening rather than the perfection of show gardens. Whilst we love the latter, it is real gardens that endure and surprise. I also had to remove a huge old ceanothus that had died for no apparent reason, but found that in my small garden I had a great deal more space, and that the replacement planting was every bit as exciting- good luck with it and do let us know what you decide on. Just digging first flower beds to turn corner of a field into a brand new garden… it’s been a journey of mud and ice and a very slowly growing brick wall since the garden plan began last November. Thanks for a lovely blog Jean, hope to read some more in future. 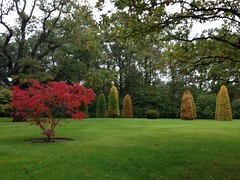 Glad you liked the garden- Diamond Day is not one I have grown so I will be interested to see how it does. When you say struggling- is it wilting? is it now in the ground or still in the container? It needs to be planted in the ground ideally or in a good sized container. Always best to plant with plenty of well rotted organic matter and mulch. Ensure it is moist but not waterlogged (if in a clay soil you will ideally need to break it up by digging in some grit and/or organic material). Let me know how it goes. The rose, Diamond day, has had a good quantity of blooms for a new rose, They are yellowy white, but the stems do not seem to be quite strong enough to support them. Now the blooms have stopped and the plant looks quite tired. Sounds like you have got it in one- if it has flowered well it probably is rather tired- feed with a rose fertiliser, dead- head, and give a mulch and make sure it stays moist. If the heads are too heavy for the stems I take a few off for the house! Keep an eye on it but it sounds pretty much par for the course. I forgot to say it is in the ground.